For a project that I’m working on, I need a way to extract each layer of a Photoshop PSD file and have them written out as separate PNG image files. To do this, my first thought was to use ImageMagick. ImageMagick is a graphics library used to manipulate images and convert them to different graphic file types, among many other things. I’ve used ImageMagick before, but I don’t use it enough to remember all of the syntax by heart, so I had to do a lot of google searches to compile this solution together. I could have rolled my own solution, but time is the enemy, so using any sort of libraries that saves you hours, days, or weeks, is an obvious win. The requirements for this system are pretty simple. A Python script can be run from the command line, given the path to a Photoshop PSD file. After the script is complete, the folder containing the PSD file now also contains all PNG files for each layer in the PSD file. Pretty simple, right? Not quite. As I was implementing this solution, I discovered some information and processing techniques that aren’t immediately available through ImageMagick’s commands. This is a no-go for my purposes, because I need to later re-composite the layers, and if each output layer is a different size, they can’t be easily merged back together. This is another feature that I was expecting to use in ImageMagick that isn’t actually there. To export a layer, you have to use the index rather than the name of the layer. I suppose this change isn’t absolutely necessary as a requirement for everyone, but I feel that it’s a lot more convenient to specify the name of a layer that’s easily cross-referenced by human eyes in the Photoshop file, as opposed to having to count what index is required in the layer stack. Not only that, you can do other selection tricks, like filter layers by specific names, which is actually the real purpose for supporting this. So those are the two major problems I ran into, and that’s the reason why I chose Python for this solution.The solution below could very well have been done using batch scripts, or some other scripting language, but I’m a Python user. There are multiple steps to get this working. In the Implementation section, I’ll spill out all the details. Before I dive into the details, I want to mention that this article already assumes that you have your environment set up to run these operations. If you’re sure that it’s set up, feel free to skip ahead to the Implementation section. Photoshop – I use Photoshop Elements, but you’ll obviously need some program to author PSD files for processing. ImageMagick – I initially started implementing this with version 6.9.3, but have since upgraded to 7.0.1. I was taken aback a bit, since by default, versions 7.0.+ have marked the convert command as legacy, and the solution in this blog post uses the convert command. If you are using this version, be sure to check the option to “Install legacy utilities (e.g. convert)” before installing it. Older versions do not have this problem. Let’s solve the problem with the irregular alpha image sizes first. I stumbled across the answer on this thread here. But I’ll explain it a little further here, as the syntax is a little strange. The first two parameters are the first two image files in the “sequence” for ImageMagick to process. The index (i.e. and ) indicates the layer to process. Layer 0 is not really one of the layers in the PSD, but it’s actually the flattened image of all layers in the PSD. Layer 2 is the second layer in the PSD, for this example. The part of the command in parentheses are options processed as a unit, before moving on to the rest of the options. It creates a clone of the first image in the sequence, and then wipes it clear as an alpha image that’s completely transparent. This new image is tacked on as the third image in the sequence. The next option (-swap) swaps the last image with the first image in the sequence, and the +delete option deletes the last image (which used to be the first image) because we no longer need it. I’m not actually sure why -coalesce is needed here, but -compose src-over sets up the image for alpha compositing such that the overlaying image is blended according to the transparency in that layer. The -composite option then performs the compositing of the two images, and outputs the file as <extracted-filename>.png. Whew! That took a lot to explain, but I hope it at least gives an idea of how ImageMagick is processing the layers in the PSD to produce the resulting images. I realize that there may be other solutions to this problem, but this is the one I found that actually worked for me. If you have a solution that is more elegant, feel free to ping me, and I can add it here. We handle exporting PSD layers by name in two parts. The first part is getting the layer names, and the second part is using those names. All of the code for this part uses Python. Here is the file in its entirety. We’ll discuss the major points about the code after you take a gander. # or substantial portions of the Software. # ARISING FROM, OUT OF OR IN CONNECTION WITH THE SOFTWARE OR THE USE OR OTHER DEALINGS IN THE SOFTWARE. So, this script accepts the name of a PSD file as a parameter. identify is an ImageMagick command, and we are using it here to get some information about the PSD file; specifically, the layer names. subprocess.check_output() is a Python function that runs an external program and pipes the output from that function into a byte array, psdInfo. psdInfo contains tons of information about the PSD file. The function find_layer_name() takes that string, iteratively parses it, and collects all the layer names identified by every occurrence of the "label: " string in psdInfo. The partition() function separates the input string and outputs a 3-tuple as 3 string objects, the delimiter "label: " being the second string object. Since we're only interested in the stuff after the "label: " delimiter, we always look at parts, being the last part of the string. Once we have the layer names, we simply print them to the output. So, now that we have a way to collect all the layer names from the PSD file, we take those layer names, and export each layer individually, using the convert command that we used to solve the irregular alpha image size problem above. extractedFilename += "_" + layer_name + ".png"
For the most part, this file uses common Python syntax and methodology, so I'll again, just point out the major points of interest. Oh look, it's our old friend subprocess.check_output()! We used this function in the other script, to get the output from the ImageMagick identify command. This time, however, we're using it on the PSDLayerInfo.py script that we just discussed above! And this time, we know that the output will be a endline-separated string of all the layer names in the PSD file. Handy! 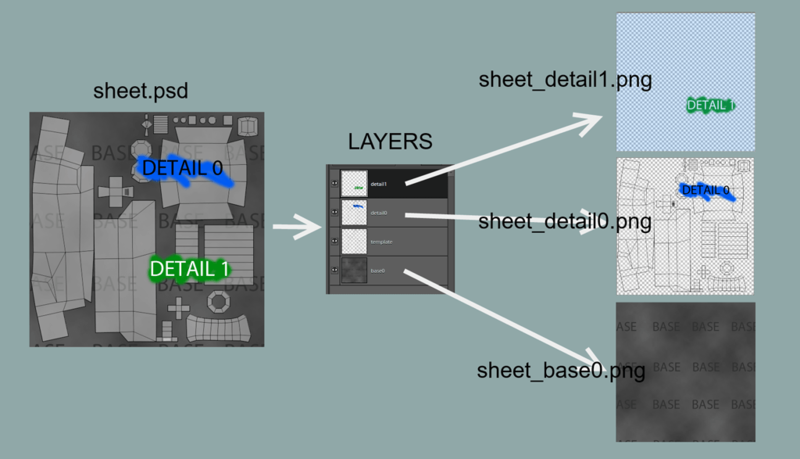 export_layer() does most of the work in this file. The first block simply takes the PSD's filename, and modifies it to append the layer name and PNG extension, resulting in the extractedFilename. With that, we call the convert function as mentioned above. Since we don't need any output from this operation, we just call subprocess.call(). Last thing to note here, is that we are looping over all layer names, but only exporting the layers with either "base" or "detail" in their name. This is what I mentioned earlier, about being able to filter out exported layers based on the names of the layers in the PSD. It's not necessary, especially if you know absolutely how many layers and in what order you want your PSD asset files to be in, but it definitely makes it more convenient. This entry was posted in Dev, Programming. Bookmark the permalink. I have used your command with Imagemagick 7.0.8-24. But I used a layered TIF file instead of PSD. My file has 2 layers. But this works just fine, if you just want to extrakt one layer from the file and still keep the original size and the convert it to PNG and keeping your transparency.